So we have the connection of both San Miguel Eskrima and Lapunti De Abanico. 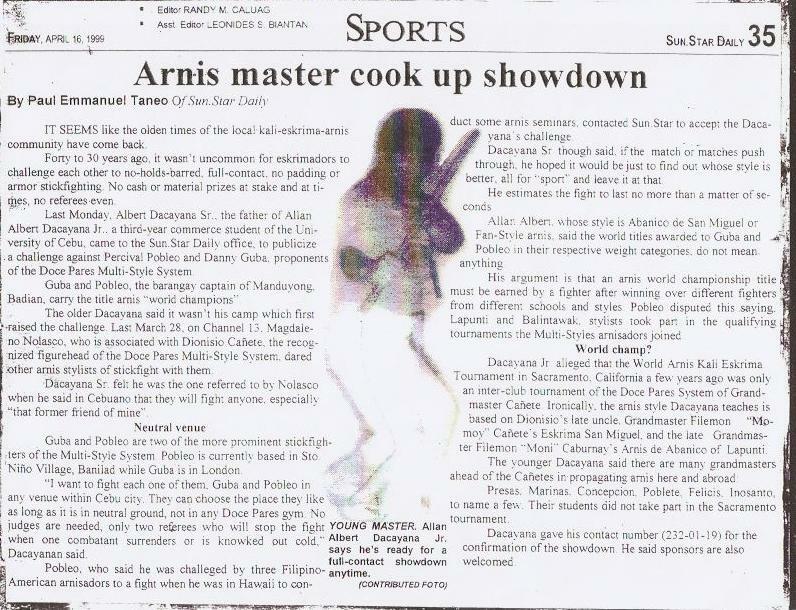 Grandmaster Jun then taught both of these systems and eventually taught them as part of his Mig-Sune-Do San Miguel de Abanico Arnis System that wasn’t generally questioned whilst it was taught in Cebu until a flashpoint in the late 1990’s. 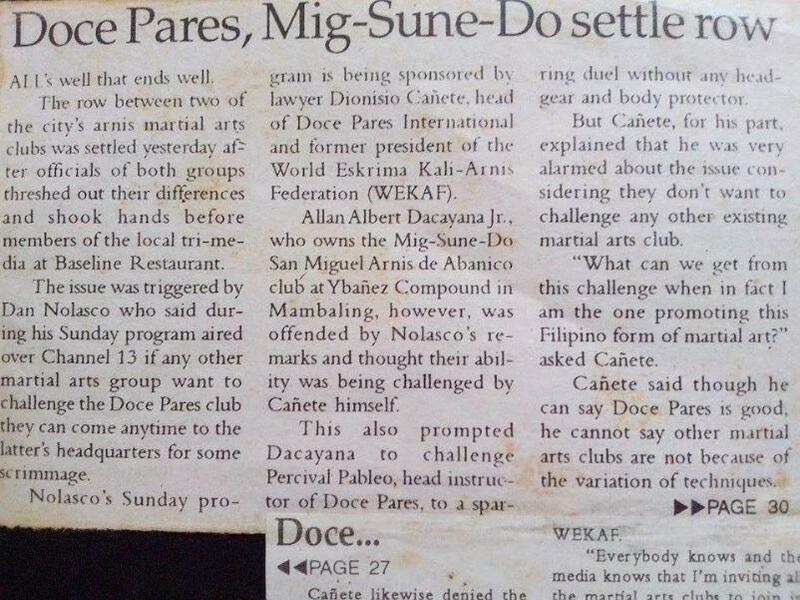 This was when a challenge from a Senior Grandmaster of the the Doce Pares School was issued to all styles in Cebu outside of the Doce Pares styles. The challenge was accepted by the relatively young then Master Jun when Master Jun’s father thought his ability was being questioned. Indeed the Dacayana system (then the Mig-Sune-Do System) was the only style to accept the challenge. Grandmaster Jun also then challenged both of the senior students of this Grandmaster to a sparring duel without body armour or head protection. A challenge match did take place (photo's withheld) and the issue was eventually resolved as GM Diony Canete clarified the situation explaining that by proclaiming the Doce Pares School was good it did not mean that other schools were not, simply they had different variety of different techniques. Here are a couple of clippings from the local newspapers at the time…. I must stress at this point that all this is history. It is documented here for completeness in analysing the lineage of the system. Grandmaster Jun’s youth prompted him to accept the challenge where today he would simply resolve any issues through diplomacy and discussion. The Dacayana System, Dacayana Philippines and Dacayana UK & Europe of course have no animosity towards any of the Doce Pares Schools or indeed any other style and wish to extend nothing but friendship towards any them or indeed any other group. Grandmaster Jun then continued to teach and propagate his developing system in Cebu and Toledo teaching at Cebu university and Schools in Toledo until in 2006 he was contacted by Jo Biggs and Marcie Harding who wanted to bring a new style to their students in the UK. The style was to be adopted by both students of the Malvern Eskrima Group under Marcie Harding and the Sacred Spring students under John ‘Jo’ Biggs. GM Jun’s first visit was to Bedford in 2007 where he introduced his system to both Jo and Marcie and some senior students before showcasing the system at an open seminar. At this time Jo Biggs made the decision to extend the hand of friendship to all styles in the UK and invited many of the senior practitioners of the other styles currently being taught here in the UK. We were pleased to welcome both John Harvey and Jude Tucker of Kapatiran Arnis during that first visit who were the most prominent Eskrimadors among other interested practitioners attending. Since 2007 to the present the system has been studied and propagated through both the Eskrima Schools of Malvern / Holywell Martial Arts and the Jujutsu schools of Sacred Spring and on the way has attracted many new schools and Teachers some with FMA experience and some without. Over the coming years and as Jo Biggs minimises his involvement, the system will continue to grow and flourish as it is adopted by more and more Martial Arts and Self-Defence Schools in the UK and Europe. This growth will be under the guidance of European Director Marcie Harding, UK & Europe Representative John Devereaux and all of the Principal, Senior and Authorised Coaches already teaching.